DO YOU ALREADY KNOW WHAT’S YOUR FAVORITE TAPAS DISH? Spanish tapas are more a way of eating than one specific dish. If you don’t know what Spain tapas are, make sure to check out our post about them. But once you are sitting at that authentic Spanish tapas restaurant, the waiter waiting for you to order, you might feel quite lost reading the menu: so many different dishes to choose from! What would be the best choice? While I usually recommend my guests to order several rounds, the first one being safe familiar products, the second being more adventurous and inspired in what you’ve seen people eating in other tables, there are a few options that you definitely need to try at some point. Today we are sharing with you what’s the Spaniards favorite tapas dishes. 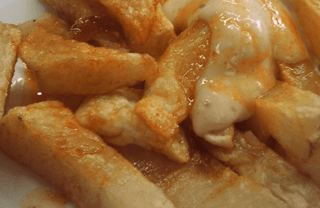 “Brave potatoes” are fried potatoes served with garlic allioli mayonnaise and a red mildly spice sauce or oil. In Barcelona, locals pilgrimage to some bars said to prepare the best patatas bravas, and there is even a controversy between those who favor the ones at Tomàs and those preferring the ones by Mandri (although there are many other great bars that could perfectly rival them). 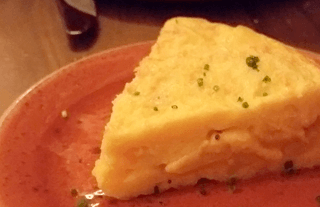 Do not confuse them with the Mexican tortillas: the Spanish tapas dish is made with fried potatoes, eggs and optional caramelized onion, and it’s actually more similar to the Italian frittata (the main difference being frittata is baked and tortilla is fried). Spanish love tortillas, and you’ll often find them with different fillings: eggplant, parsley & onion, artichokes… But the king of Spanish tapas remains that of potatoes. A slice of bread with a variety of toppings, this tapas dish is original from the Basque Country. The name “montaditos” refers to the process of “montar” (assembling) the toppings over the bread, while “pintxo” is also how we call the toothpick that they stick on them (don’t throw them away: at the end of the meal the waiter will count the toothpicks to know how much units to charge you). Spanish ham, salmon, fish paté or cream cheese are our favorite flavors. 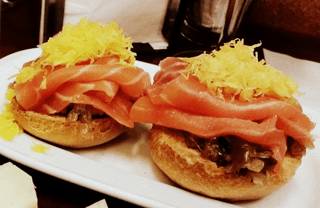 We always visit at least one pintxo bar in our tapas tours because they are fun. Yes, that’s probably the kind of Spanish tapas you might not be too likely to order yourself. However, chipirones are another classic tapa you should try. 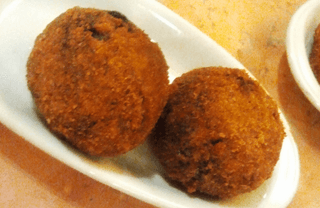 You’ll often find them battered and deep-fried, but they are also served “encebollados” (cooked with onion) and with scrambled eggs. BTW, in this other post you’ll find other great seafood tapas. Spanish tapas also include veggie options, and the green peppers from Padron in Galicia (North of Spain touching Portugal) are undoubtedly the most popular. They come simply fried and sprinkled with sea salt. What makes them special is that most of these peppers aren’t spicy, but from time to time you get one that’s really hot, and there is no way to guess which one will be: a platter of Padron peppers is like a Russian roulette, in this sense! AND BONUS! My personal favorite Spanish tapas? A favorite of both kids and adults alike, these small bread-crumbled fried rolls are never made with mashed potato in Spain, but with a thick bechamel white sauce instead, to which other ingredients are added. Chicken or ham are the most common flavorings, closely followed by cheese, codfish and mushrooms. I recommend asking what are they made of before ordering. So what about you? Head to the comments below and tells us: what’s your favorite tapas dish?